I love finding a great vintage pattern of any sort. There is a world of information out there waiting to be brought out of the archives and stitched up. I was thrilled to find an Annie's Pattern Club 1984 pattern written by a designer of the day named Cathy McFarland. 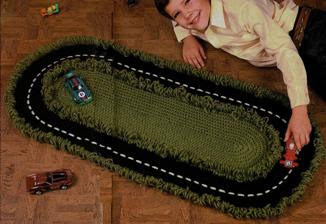 A super clever pattern, the Road Rug (super speedway) seemed like the perfect choice for my house full of boys who just love to race their cars all over the carpet. Original cover photo "Road Rug"
The pattern itself was uncomplicated but, as always, I try to get into the brain of the designer and actually understand how and why a pattern is written in the manner that it is instead of just happily and blindly crocheting my way to the end as I should. Even though I did manage to get to the last round of the rug, it looked as if I would run out of yarn just before finishing. I was so disgusted about my poor yardage calculations before beginning (I find that my extreme, obsessive eagerness to begin a project usually outweighs any clear thinking about yardage and hook sizes before I begin) and the look of the project when I laid it out on the table to ooh and ahh over that I completely abandoned the project two months ago. My first, pitiful attempt at making this a cute project. I dug it out again just last week after some new yarn called to me (as if I don't have enough) at the store the other day. With a certain little tot's birthday rapidly approaching, I thought I would give it another try. This time, unfortunately for me, I just started from scratch and rewrote the whole, dumb thing. Why? Because the original looked terribly sloppy and thin (well, I was using worsted yarn instead of the recommended rug yarn after all) with it's makeup of half double crochets! It must have been the "stitch of the day" back then because I find it used in nearly every vintage pattern I've encountered that was written before 1990. Yikes. It is certainly a lot quicker than a single crochet but does not have the tightness or sleek finish of the latter stitch. I'm willing to put some extra time into my projects to get a neater finished result. Can you imagine the contemporary "amigurumi" being stitched in a half double crochet or greater? No, no, no. The HDC definitely has its place in lacework, pattern stitches and making interesting shapes but you will not find it used in my patterns if a SC can be used instead. My final work after completely redesigning the pattern. Here is my pattern ready for you to try. Please feel free to edit, if necessary, and post your edits on Ravelry. I wrote it in a rather unconventional way so you can see how the circular ends are worked (increasing 3 sts on each end) and how the sides each contain 54 sts. This should make edits easier. Try working it up in some earth-friendly wool for a green holiday gift- Enjoy! The first sc(s) of each Rnd will be worked in the same st as joining. Rnd 21: ch 1, turn work so back side is facing you- you will work this round in the opposite direction as previous rnds. loop stitch (lp st): insert hook in next sc, wrap yarn 3 times clockwise around two fingers, insert hook into all lps on fingers and pull through the sc, drop lps from fingers, yo, pull through all lps on hook to complete sc. Rnd 40: ch 1, turn work so back side is facing you- you will work this round in the opposite direction as previous rnds. Flip Rnd 42 to back of rug and stitch down to back using a long strand of black yarn and a tapestry needle. Using a doubled strand of white yarn (or glow-in-the-dark yarn), stitch road lines evenly (approximately every two sc sts) around track between Rnd 30 and Rnd 31. Lay a piece of black felt on back of rug and cut out the approximate shape of rug leaving about 2” to fold under. Fold the extra 2” under and stitch to edge of rug using a small needle and sewing thread. To keep the layers flat and held together, sew through both layers (felt and yarn) using a running stitch around the edges of the black track as if you are quilting. Wish I'd seen this when my boys were little. HOW CUTE!!!!!! WOW, this is AMAZING! I'm so glad I discovered your blog!!! I'll be linking to this and I'm adding you to my reader as well! Christmas present for my nephew SORTED. That is so great! Thanks for this pattern - I know many little boys who would LOVE something like this! Wow! Great job! I completely agree with you about the sc vs hdc and dc stitches. Yours looks so polished and great! This is one of the most beautiful & creative rug patterns that I have seens. My son is older ... but I would definitely make it as a wall hanging. Thanks for sharing. Oh, I'm so glad to see this pattern! I made it for my boys when they were young - now one is married/in college/a dad, and the other is in the Navy. They really had fun playing on this rug for ages! Thanks for bringing these memories to mind! Hi all! Thanks for your comments- they are fueling my next project! In response to the questions about how much yarn for the racetrack rug... I recommend at least two skeins (but three just to be safe and for any mishaps) of green and one skein of black. I used Red Heart Super Saver yarn and it came in a 7 ounce skein. This is approximately 364 yards according to their website. Enjoy your projects! This is AWESOME!! I'm so making this for my grandson. Thank you for writing this up too in sc! Question: I've been told since I started really crocheting more last yr. that a person cannot sell a finished product from a pattern. Is this true? Is it true for all patterns or for modern ones only? I would love to sell the work I do from patterns, but I'm not sure if it's legal or not??? So glad you like the pattern! In general, it is true that you should not sell your work from patterns that others have created, including commercial patterns. I wouldn't worry too much if you are selling a few items to friends and such. Some independent sellers (including patterns from my store candypopcreations.etsy.com) will sell you a license that allows you to sell as many items from a pattern as you like. The Racetrack Rug pattern was my interpretation of a vintage pattern. I don't have any copyright on it so I certainly don't mind if you sell items based off of it. Best wishes! This is awesome! When I first saw your post I was thinking... She's probably selling the pattern so I'm going to need to design my own... Then I kept on reading and scrolling and realized you are one of the generous designers who SHARE! I'm so excited because I know my kids are going to LOVE this! The best part is that it's machine washable and will last for a very long time. Who knows... Maybe grand kids will benefit someday! Thanks for sharing! This apttern is wonderful and my son is going to love it when I'm finished. However, I ran into a problem on round 36. I believe that the lat group of sc should be 8 and that equals 306 sc total. I ripped this round out a couple times before I decieded to count them, then add the sc's up in your round. One thing I'm wondering about, though, and that is size. Using worsted weight yarn and H hook, how long is the rug in the end? I'd just like to figure out that if I use bulky yarn and K-L hook, and follow your instructions, would the end result fill up a whole room? The finished rug is just over 2ft long. If you use a larger hook and yarn it will certainly be bigger but probably not enough to fill up a whole room. You can just add some more rounds to make it larger. Have fun and thanks for the comment! Hi! I just had to tell you what a wonderful idea this was! I made one from your pattern (with quite a few adjustments of my own for personal preferences) when my son was about 20 months--he's so into anything with wheels. We didn't have much floor space b/c of a small house, so I made it fit the top of our coffee table and I'm pretty sure he has played with it every day since! That's been about a year. I took out the looped stitch b/c his cars got caught in them and the loops would pull out, also, I made another "road" in black to stitch over the center part and curve for added interest, plus a red circular Stop sign and a green circular Go sign and stitched them on. Maybe that will give some other folks more ideas. This was so great and worth the time! I want one, but this is a bit beyond what my abilities will allow. i ran into a problem on r36 in the second line it says "sc in next 23sc" it should say "sc in next 17sc" to add up to 306st just fyi other than that everything is great! Very nice!!! I have 2 little boys who would LOVE this!! Hi I can't tell you how adorable this is. I want to make one as achristmas gift and I am very new at the craft of crochet but I have taught myself and learned quickly so I feel confident I can do this project,however, I have a question. I am using Aunt Lydia's craft and rug yarn %100 polyester 3 ply. and I am on rnd 8 now only it keeps rolling on me. the whole project thus far is twisting. I loosend up on my stitches ( I have a tendency to pull to tight) but it is still doing it. will it straighten itself out later or is it doomed? I know you said it was originally done in rug yarn (because of a lucky garage sale find i have tons) so should I do hdc instead? Please help! 6545253I made this for my oldest son years ago and the thing he complained about was the loops along the inside and outside of the track. He said that the wheels of the cars got caught in the loops. This lead to my thinking of a dirt track which would have bales of straw around the inside and outside of the track. Which I am now making for my youngest son. To give perspective there is 16 years between my oldest and youngest sons. My oldest son when he outgrew playing with his hot wheels used the rug as a dresser scarf. If you make this rug you might consider using a reverse single crochet instead of the loops. Would you please tell me the dimensions of the completed rug? this is an adorable rug.I have a question about the round 36 that i have seen several people say is not correct. May i ask what the true stitch count is for this row because everyone is saying something different. Is the original pattern you changed available so that i may look at it? is a textile artist in a permanent state of inspiration. Meticulous in the design and craftsmanship of her work, she aims to bring a unique, contemporary flare to classic fiber art.